Do you want to ride on the Tasmanian wolf? 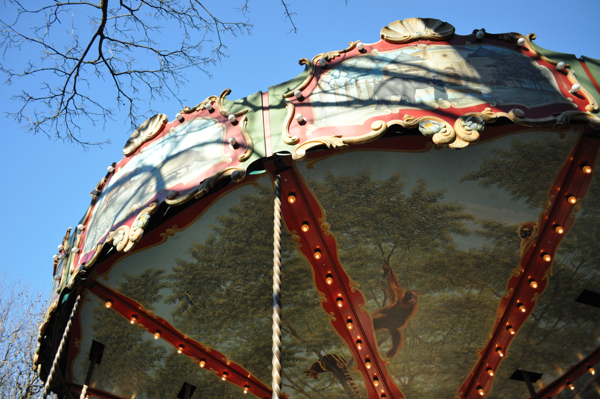 Let’s have a ride on the most curious merry-go-round you can imagine: which animal do you want to get onto? The Tasmanian wolf? This is the last specimen because the last real one was shot in Tasmania in 1961. Or what about the aepyornis, a kind of oversized ostrich, the biggest bird of all time? Or the Atlas lion? Or the dodo himself, a strange pigeon from Madagascar that could no longer fly and had no predators – until men started to eat them. All the animals of manege Dodo are extinct or endangered species. Just read the hand-painted wood sign in front of this picturesque carousel and you will understand that this beautiful adventure started in the head of somebody special. It was Jean-Jacques Haler who had the idea. He used to work at the at the Museum of Natural History, in the department of compared anatomy. The bones of extinguished specimens were somehow his everyday business. 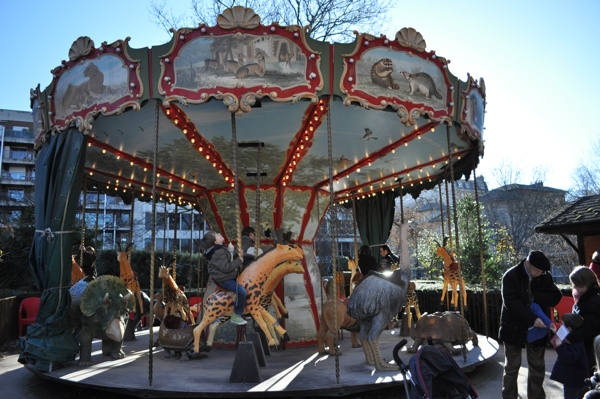 One day, back in 1992, strolling through the Jardin des Plantes with his little son, he had the idea: why not make a merry-go-round that is different? Why not do something extraordinarily beautiful which gives an ecological message at the same time? I love this manege. And my sons do too. Even the older one, seven years old and pretending not being interested in carousels anymore, got on the other day. You won't see many tourists here: this is for locals, for kids, parents and grandparents. In summer, late afternoon, when school is out, you will find lots of children happily getting onto animals that don’t exist in reality anymore. On ugly winter days the manege often stays closed, the green tarp sealed tightly. But as soon as the sun comes out on a Sunday morning, the merry-go-round will go round and round and round. And they all lived happily ever after.